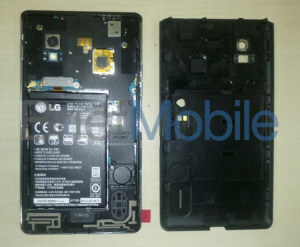 The monstrous LG LS970 Eclipse 4G LTE broke cover once again, revealing two more bits of its specs sheet. In case you missed it the first time around, the Sprint-bound smartphone packs a quad-core Krait processor (at 1.5GHz), 2GB of RAM, 13MP camera, LTE-connectivity and a 4.67" 1280x768px LCD. Anyway, the new spy shot shows the LS970 with its back cover off, which reveals "LS970" engraved on the chassis. We get to see that the 2100mAh Li-Po battery is user removable and there's NFC connectivity available, too. Interestingly, there's a hole in the back cover, but it's unclear if it serves a specific purpose or it's just that this particular unit is damaged (the hole seems too irregular to be on purpose). The LG LS970 Eclipse 4G LTE is still unofficial and the rumor mill is quiet on expected availability dates, but we do know it's headed for Sprint. LG has another droid with 2GB of RAM - the Optimus LTE2 - though that's South Korea-only for now and it only has a dual-core Krait processor. Perhaps available in 2013... what about eight/sixteen cores in 2015 ? The WOW factor seems to pay well, doesn't it ? Okay if this comes out with that kind of specs then either its battery will last like 2 secs or its going to last longer and it is going to be the best phone on the market.I mean what the hell? ?It's like they are making a small mobile workstation!